Japan’s Kimiko Date Krumm became the oldest winner of a WTA Tour tournament since Billie Jean King in 1983, beating second-seeded Anabel Medina Garrigues of Spain 6-3, 6-3 for the Korea Open title Sunday. Date Krumm turns 39 on Monday. King was 39 years, 7 months, 23 days when she won at Birmingham, England. The title was Date Krumm’s first in 13 years and eighth of her career. Formerly ranked No. 4 in the world, she quit tennis in 1996 before returning last year. She beat top-seeded Daniela Hantuchova of Slovakia 7-6 (3), 4-6, 6-4 in the quarterfinals and defending champion Maria Kirilenko of Russia 3-6, 6-2, 6-4 in the semifinals. After needing only 1 hour, 27 minutes to beat Medina Garrigues, Date Krumm ran to the stands to embrace her race driver husband, Michael Krumm of Germany. “Above all, my husband’s love was a big help for my win,” she said. Date Krumm won her last WTA title in August 1996, beating Spain’s Arantxa Sanchez Vicario at San Diego. Krumm says she is confident about playing pro tennis for at least a few more years. I am less than confident she return to her mid 1990′s form. 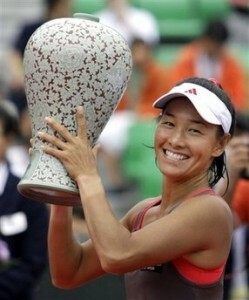 Still I congratulate Krumm on her win.